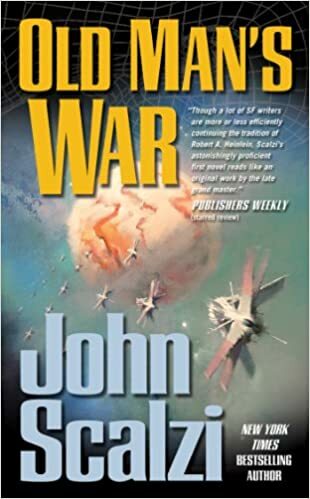 One of my closest friends gave me a copy of John Scalzi's Old Man's War for my birthday this year. I had told her that I want to read more science fiction but that I find the genre a bit intimidating, especially the more traditional "space operas" and wasn't sure where to start. She recommended Scalzi to me and then gave me this first book in a series. Old Man's War is about John Perry, a 75-year-old man who signs up for the Colonial Defense Force (CDF). The CDF takes old people from the Americas, gives them new, powerful, green bodies, and then sends them out to engage in inter-planetary warfare to defend human colonies in outer space. Most of these colonies are people by Asians and Africans, who were bombed to oblivion by the western world in a Subcontinental War. I'm really glad that my friend gave me this book to read as an introduction to space opera because right from the beginning, I felt super-comfortable with the book. John's narrative voice is wry and self-deprecating and really funny, and I immediately felt welcomed into his world. The story also moves pretty quickly and introduces some really great characters. The humor is just as important, if not more important, as the science and the plot and all the rest. It's a really fun introduction to science fiction, and I highly recommend it to anyone who is unsure of where to start with "traditional" science fiction but wants to give it a try. That said, there were a lot of things about this book that raised several red flags. These I detailed out to my friend in very long-winded text messages. Let me also just say before I get into all of these that both my friend and I are very feminist and very aware of white-washing and everything else that I'm about to talk about, and both of us still enjoyed this book. Also, she said that some of my concerns are addressed by Scalzi in later books in the series, even if they were not addressed in this first book. Very close to the beginning of this book, a pretty vile character points out that all of the space colonists are Indian (he calls Indians "Hindis" and "dot heads"), which is unfair because they lost the war and losers shouldn't get to colonize space. All the white people (apparently being American = being white) can only get into space by joining this Colonial Defense Force. This is insane because dot heads who lose a war on earth should not then get the protection of superior beings in space. The whole race thing is brought up VERY clearly and intentionally, and yet, for the rest of the book, there is zero interaction with any colonists. Based on the names that everyone on the Colonial Defense Force have, I would guess that there is also very limited interaction with anyone that isn't white or Hispanic (though everyone in the force has green skin, so "white" is a misnomer, maybe). I know that science fiction generally has a diversity problem, so it's not that I was expecting a gloriously diverse cast here, but I was frustrated that the race thing was brought up so early on and then never again acknowledged or dealt with again. It's like Scalzi was using the other racist jerk as a foil just to show readers how open-minded and kind John Perry is in contrast, which is annoying. Mostly because he is using a conversation between two white men to show that one is racist and the other is not. I would believe it more if anyone who was not white had a voice in the conversation. And then, we are supposed to believe that John Perry is this upstanding guy who is not racist, but then he cheerfully goes from planet to planet killing other intelligent species who have built up cultures and histories over time. There is a moment when he acknowledges how bad this makes him feel, when everyone around him acknowledges it as well. But then they just move on and continue the destruction. This I guess would be somewhat understandable if you're 20 years old and had never been through a war before or thought about other people before. But again, John is at least 75 years old and had protested wars on earth. But seems to think it's a totally different ball game out in space. And again, they never once engage with colonists, so you don't even really know how he feels about people who are not the same as him. There was one scene in the book that stood out to me a lot, possibly because I also recently finished I am Malala, and she spent a bit of time talking about the Taliban. Some years ago, the Taliban destroyed ancient beautiful Buddhist statues. There was a huge outcry for reasons I hope I don't need to outline here. In Old Man's War, there is very brief moment in which John leaves a spaceship to go onto an alien planet. He sees "an abstract sculpture of some description" and blows it up. "Never much liked abstract art." Possibly, I am a little too sensitive at this time, since this was clearly supposed to be a moment of comic relief prior to war. But all I could think was, "IT MIGHT NOT BE UGLY ABSTRACT ART TO THEM, JERKFACE." And that's really where I feel like this book had a lot of unmet potential. We're led to believe that John is this great guy because he has an excellent sense of humor, a lot of people like him, he treats his comrades well, he seems fairly smart, and he stood up against racism that one time in a pretty low-risk setting. But then through the rest of the book, you don't see any of the stuff he questions or worries about come back to him in terms of how the war effects him or how he interacts with colonists. It felt very "here's the white savior you've all been waiting for!" And that annoyed me. That said, I think I am going to read the next book in this series. My friend said Old Man's War is an introduction to a complex and well-plotted series. I trust her judgment, and the book really was enjoyable if you're not as hyper-sensitive as I seem to be these days. Has anyone else read this series? Any thoughts on how it evolves as it continues? Thanks for the perspective! I just found Scalzi on Twitter, and you're right, he does seem to be on the right side of history, and perhaps he explores more of these concerns later in the series or in a different series completely (he seems to have many books). I also read this book (and all the sequels) some years ago, and don't remember the things you bring up. This is what I said about it at the time: http://necromancyneverpays.blogspot.com/2008/05/late-to-scalzi-party.html. I reviewed The End of All Things, which brings together plots from all over the fictional universe of the Old Man's War series, on Sept. 21, 2015. The Collapsing Empire, the newest in the series, comes out in March 2017, and I'm going to read it. It is very, very possible that I was hyper-sensitive in reading this book. I don't know that I was fair or that other people would have noticed the stuff that I did. Maybe because I was reading traditional science fiction by a white guy, I was pickier? I don't know. I feel like you would have noticed stuff, too, if it stood out to you. Whoa, I was just thinking about this trope! Not the white savior one, but the thing where a bad white person in fiction says something racist, and the corresponding good white person slaps them down. I was thinking about it because I've been talking a lot on Twitter about practicing standing up for what's right, and modeling good behavior, and I have two really conflicting views about this trope. One is that it's so important (more now than ever!) for fiction to reflect some of the values that are being lost/forgotten/trampled in the new administration, and in that sense I think it's good for it to model how privileged people *should* behave in situations where they encounter prejudice against less privileged people. And then the other is that I'm really, really tired of this trope where only bad people are racist and Our Hero is white but GOOD white, because I think it lets white folks off the hook and doesn't depict what most often happens, which is that liberal white folks are too paralyzed by nerves and social convention and internalized racism etc to actually confront this kind of thing as it goes by. So I don't knowwwwwwwwwww. Like, I feel that way, and I was also terrified as I was watching Hairspray by the idea that its message of integration and inclusion has become controversial? In a way that ten years ago it wasn't? I DUNNO AARTI I DUNNO WHAT TO THINK OR FEEL. Ok, this is a valid and excellent point. Hmm, I don't know how I feel, either. Of course I DO think that people should stand up against racism and discrimination. But in this book, in this scene, it just felt like such a throwaway. Why bring up the fact that race determines who gets to be a colonist and who does not, and then never do anything with that fact again? And while I do love white people who stand up against racism, it's usually up to a lot of non-white people to do it and to put themselves in pretty untenable positions to do it vs being safer and more "trusted" if you are white and do it. I would have felt better about it if I had any reason to believe that the main character had ever in his life interacted with someone who was not white, but there was no signal on that front, so it was almost like - well, it's easy to not discriminate against others when everyone is the same, but what would you do if you actually came up against people who were different than you? And in this situation, the answer (at least when confronted with intelligent aliens) was not really to question orders or anything but to go out and do what you were told. In which case, it's hard to believe that he REALLY would have stood up against racism if he had any skin in the game. So yes, I will continue with the series because he seems very self-aware and cognizant of bias and discrimination, so hopefully that comes through in the books, too.